New ideas, new scientific discoveries and changes to manufacturing technologies often drive innovative medical device development. The regulatory process heavily affects the device development pathway. Globally, there are many changes occurring in the Life Sciences Sector from a regulatory perspective. Each regulatory body across the world is adopting improved compliance requirements, changing the development process pathway. The European Union has experienced high profile medical device failures such as hip replacements and ruptured breast implants driving changes to EU Medical Device Regulations (EU MDR). New regulations mandating traceability and transparency will improve patient safety. In the United States, the Food and Drug Administration’s (FDA) Center for Devices and Radiological Health (CDRH or the Center) is responsible for advancing public health and facilitating innovation to help bring novel technologies to market and make the medical devices that are already on the market safer and more effective. In Canada, The Therapeutic Products Directorate (TPD) applies the Food and Drug Regulations and the Medical Devices Regulations under the authority of the Food and Drugs Act to ensure that the pharmaceutical drugs and medical devices offered for sale in Canada are safe, effective and of high quality. 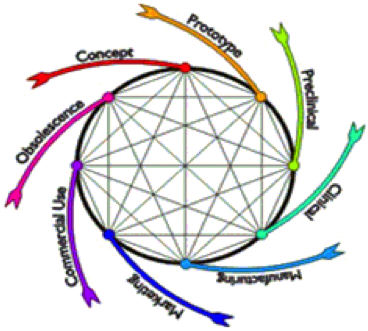 What does the medical device product development lifecycle look like? The CDRH uses the Total Product Life Cycle model exemplifying the cyclic nature of the development process. Regulatory pathways should account for the inevitable cycles of design-prototype-test-redesign that are inherent to the development process. After a device concept occurs, any stage afterward can lead right back to concept if it is unsuccessful. Automation is crucial in reducing time to market by providing consistent manufacturing processes. Product concepts and designs are frequently influenced by feedback when assembly manufacturing equipment is designed. Considerations ranging from product reliability to cost savings are realized when working with experienced automated original equipment manufacturers (OEMs). Strong OEMs can aide in reducing redesign cycles by anticipating expected failures and offering effective testing methods. Automation is often essential to meeting changing regulatory requirements such as device identification, data collection, device testing and evaluation. The FDA mandated Unique Device Identification (UDI) in 2016, requiring all medical device labels to have a standardized 2d barcode formatted with a code registered with the regulatory body. The UDI code is confirmed by a vision system for presence and readability and logged into a database for traceability. Medical Device Identification is also achieved by use of Radio Frequency Identification (RFID). Similar to UDI, the RFID tag would have a Unique Device Identifier written to it, confirmed with a reader and logged to a database. Collecting device information after manufacturing can be automated and used by the manufacturer in a development cycle. We are entering the fourth industrial age, where information is the key to competition. From manufacturing to clinical trials, clinical evidence and post market surveillance. Traceability and data analysis work to reduce device redesign cycles and improve reliability and performance. The development pathway can benefit dramatically by having as much key data available to support the validation and qualification processes required to bring a product to market. How does IAI improve the medical device development process? Innovative Automation’s Applications Specialists and Designers work closely with our customers listening to their specific needs. Through Design for Manufacturing and Design for Assembly reviews, our team will make recommendations to product design that will improve the robustness of the assembly process and decrease the overall cost of the assembly equipment ownership.